Sundials are not just for the garden any more! The Spectra sundial is an indoor custom sundial and functional handcrafted art piece that is designed to be placed indoors on a table by a sunny window or directly on a window sill and enjoyed year round. 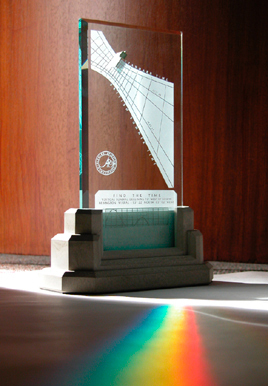 Unique among sundials, the Spectra sundial earns its name by producing vivid prism beams throughout the day, flooding the room with intense rainbow color as it uses the sun to chart the rhythm of the seasons and accurately tell the time of day. 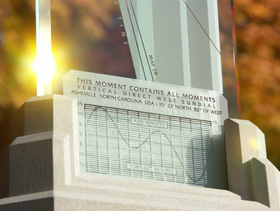 The Spectra sundial makes a perfect birthday gift, personalized anniversary gift or unique wedding gift idea when customized with a special inscription and date line of the special event - then every year the anniversary day will become an extra special day, because the sun and earth will align on that date each year to make the time shadow follow the corresponding date line on this special anniversary sundial. A unique "moment mark" can even be added to the special date line in some cases to celebrate the actual moment in time that the couple was married! 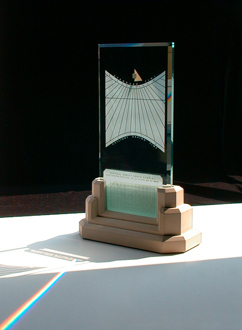 Every Spectra sundial is individually designed for each new owner, meticulously handmade to order and signed by it's original designer Jim Tallman, making each Spectra sundial a truly unique one-of-a-kind sculptural piece and perfect personalized gift idea for "the person who has everything." In addition to accurately telling the time of day to within minutes, unlike most mass produced garden center sundials, each of these distinctive beveled glass sun clocks is a truly exquisite sun sculpture and perfect decoration for a sunny space...an exclusive upscale interior accent that adds a delightfully colorful sense of energy to any room. A perfect last minute personalized gift idea! You can instantly buy a Spectra sundial gift certificate that you can print out yourself - then your recipient(s) will be able to contact us directly and have the experience of getting a special personalized custom sundial made exactly as they wish, whenever they are ready. The Spectra sundial gift certificate is the perfect gift to celebrate a wedding, anniversary, or birthday...you can give them colorful days and a gift they will enjoy for a lifetime. A Spectra sundial gift certificate makes a wonderful last minute wedding gift or unique personalized anniversary gift idea! Click on the pictures for a closer look, check the sundial details page to learn more about these special custom sundials, see a sundial gallery of Spectra sundials in the home and read customer comments about them, or you can go directly to the Spectra sundial ordering pages to learn more about how you can get one of these custom sundials or buy a sundial gift certificate so your gift recipients can have their new sundial made according to their wishes at a later date. 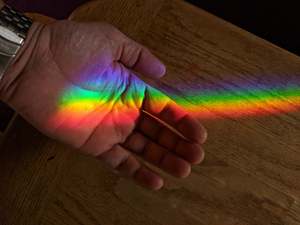 We have sent Spectra sundials all over the world - the sun never sets on them, and there is always one of our custom sundials in the light of day and making rainbow colors somewhere in the world. Have a look at our interactive World of Sundials to see where many of the Spectra sundials have gone, how their sundial layouts vary with location and the direction they were designed to face, and see which Spectra sundials are currently under the sun right now! Custom sundial details such as special date lines and inscriptions can be added to Spectra sundials at no extra charge to create an ideal family heirloom and celebrate special family occasions such as birthdays or anniversaries - the tip of the time shadow will ride the birthday or anniversary date line each year during the course of that special day. Special details can often be added to celebrate your moment in time, and we will make suggestions and work with you throughout the process to make sure you wind up with the best personalized anniversary gift you'll ever find. the prestigious Sawyer Dialing Prize. The Spectra sundial is a unique bespoke interior accent, as well as a true scientific instrument with all of the features necessary to tell accurate clock time using the daily movement of the sun across the sky. If the magic of the ever-moving shadow is not enough to elevate your spirit then the glorious saturated rainbow color that this sundial creates surely will.